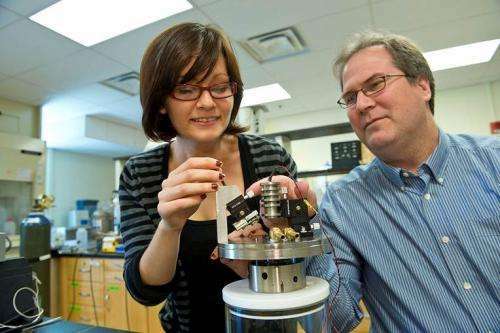 Chemistry professor Steve Higgins and graduate student Jacky Bracco examine their hydrothermal atomic force microscope. (Phys.org) —A high-power atomic force microscope that could revolutionize the study of materials at high temperatures and pressures is coming into focus in a Wright State University lab. Steven Higgins and his team are building a new version of the hydrothermal atomic force microscope, an instrument that could unlock scientific mysteries and be used in the study of oil production, hydrofracturing of rock layers, storage of radioactive waste and the capture and storage of atmospheric carbon dioxide. "I took a post-doc position at the University of Wyoming that was built around building one of the very first hydrothermal atomic force microscopes," said Higgins, Ph.D., professor of chemistry and associate director of Wright State's Environmental Sciences Ph.D. program. "Ever since, I've been interested in building the next best microscope." Unlike a conventional optical microscope, the hydrothermal atomic force microscope consists of a sharp probe mounted on the end of a cantilever. The cantilever becomes a sensor when the probe comes into contact with the material being studied, creating an electrical signal that creates an image on a monitor. The "atomic force" of the microscope comes from the interaction of the atoms of the probe and the surface. Higgins helped build such a microscope in the late 1990s. It was capable of imaging surfaces at temperatures of 150 degrees centigrade and pressures of 10 atmospheres. The new version would take it to 250 degrees centigrade and 80 atmospheres. "If we are able to hit 250 degrees, that is truly phenomenal," Higgins said. "That puts this microscope way above the existing technology. There may be broader research community interest in a microscope that can operate in those conditions." Conventional scanning electron microscopes normally must be operated in a vacuum, usually in the unreal world of a laboratory. The hydrothermal microscope can look at minerals and other solid surfaces as they react with fluids in their native environment, giving a more accurate view. This gives the microscope applications in corrosion science and mineral scale formation, which is important to the oil industry. "Just like an artery would tend to get blocked with plaque over time, well casings tend to get blocked with mineral scale," Higgins said. "That reduces productivity, increases costs and eventually results in the inability to extract petroleum." 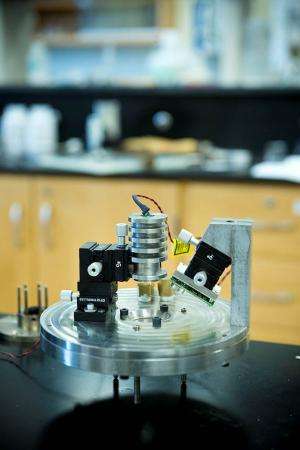 The microscope is being built through a partnership with Oak Ridge National Laboratory, which has a team of geoscientists who are focused on high-temperature, high-pressure reactions at mineral fluid interfaces. "They're interested in bringing their suite of instruments to a new level," Higgins said. "They're funded to look at problems that might be related to hydrofracturing, radioactive waste storage, carbon dioxide sequestration. These are geochemical problems that the U.S. Department of Energy is worried about." The microscope could also help answer questions that would advance the understanding of basic science. "How do these particular atoms behave at the atomic scale at these temperatures under these conditions?" Higgins said. "This type of microscope is really second to none in terms of its ability to answer questions that might be formulated around that premise. Occasionally, you learn something that's quite unexpected." Higgins said the manufacturers of commercial atomic force microscopes are not that interested in raising the target temperature. "So we have to build them on our own," he said. "We have to design them, we have to test them, we have to apply them to our own problems." Jacky Bracco, a Ph.D. student in environmental sciences from Atlanta, is helping build the microscope. Mechanical engineering shop supervisor John Lawless and engineering student Matthew Pifher have also worked on it. "The primary challenge is taking the materials we were using in the old iterations and using them at the higher temperatures," Bracco said. Higgins said it will probably be a year before his team knows whether the new microscope will be able to hit 250 degrees. Then why isn't the Oil industry paying for this research?